Costa Rica is home to some of the best whitewater rafting rivers in Central America. The Rio Pacuare is regarded as one of the best rivers in the world, not only for its great rafting, but also for the amazing scenery. There are several other awesome rivers in the country, most of which are in the North Central region. 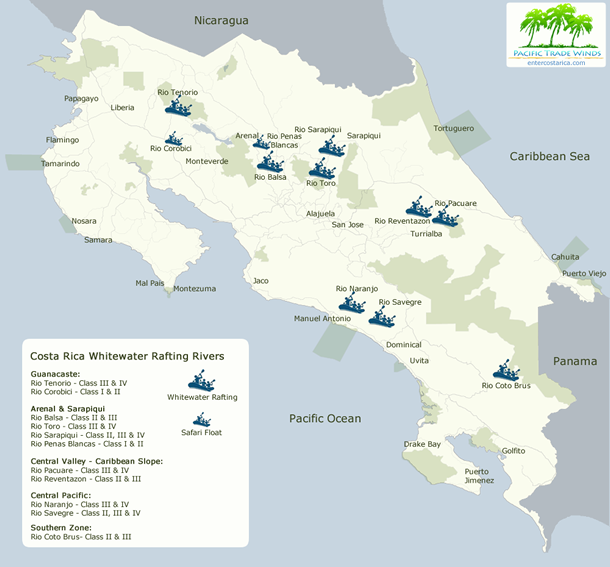 As you can see, Manuel Antonio and Dominical are the only beach areas in the country with easy access to rafting. There are no whitewater rafting rivers in the Guanacaste area. Click here to view the large version of this rafting map.